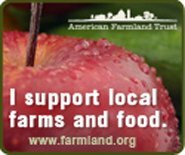 There are plenty of reasons to buy a share in the bounty of a farm that follows the Community Supported Agriculture (CSA) model of small farm agriculture rooted in growing a variety of crops in an earth friendly way. Freshly harvested food tastes better; buying food from a CSA keeps money in the pocket of a local farm family and protects local farmland; shareholders in a CSA develop a relationship with a particular farmer and a personal connection with a piece of our mother earth that can be visualized and experienced; participants in a CSA diversify their diets and try new foods (my most recent CSA weekly share in mid June from Roxbury Farm in Kinderhook [Columbia County, NY] included just-picked salad mix of various greens, head lettuce, Chiogga beets, snow peas, arrowhead cabbage, broccoli rabe, cucumbers, summer squash, zucchini, turnips, cilantro, parsley); decreased transportation for food and reduced packaging conserve energy. To this mix of reasons, the worsening of the California drought provides another excellent one. More than one-third of the vegetables grown in the United States and a startling two-thirds of our fruits and nuts come from California. The Salinas Valley in California has become the national center of vegetable production, with some remarkable production statistics: 99% of artichokes, 92% of broccoli, 94% of processing tomatoes, 94% of celery, 86% of garlic, 83% of cauliflower, 76% of head lettuce, 67% of carrots, and 58% of asparagus are grown in the Salinas Valley and distributed throughout North America. (These statistics are cited in Professor Christopher Henke’s historical and sociological analysis of the Salinas Valley’s production of “niche market crops on an industrial level” in Cultivating Science, Harvesting Power – Science and Industrial Agriculture in California (The MIT Press, Cambridge, Massachusetts, 2008) previously reviewed on this website. An eye-opening story, Your Contribution to the California Drought by Larry Buchanan, Josh Keller and Haeyoun Park in the New York Times (5/22/15), noted that “each week, the average American consumes more than 300 gallons of California water by eating food that was produced there.” This startling fact explains why “nearly 80 percent of all the water consumed” in California is used in agriculture. Relying on calculations by the Pacific Institute, based on the institute’s estimates drawn from “local climate data and plant physiology data reported by the California Department of Water Resources and crop yields reported by the United States Department of Agriculture (U.S.D.A. )”, the newspaper’s report notes the gallons of water required to produce approximately 50 types of foods; some examples: 24 gallons for a bunch of grapes; 15.1 gallons for 2 ounces of rices; 42.5 gallons for three mandarin oranges, 1/2 gallon for 3 celery sticks or a tomato slice; 7 gallons for 3 and a half walnuts. Perhaps, most critical are the 143 gallons of water for the average American’s “four glasses of California milk each week” and 86 gallons for 1.75 ounces of beef. With the recent news reported in the New York Times (6/13/15), California Cuts Farmers’ Share of Scant Water, Rare Measures Are Set for Longtime Users, by Jennifer Medina that “farmers with rights to California water dating back more that a century will face sharp cutbacks,” for a family’s food security, the California drought provides another compelling reason to join a local CSA farm. We recently reported that some established CSA farms have been slower to sell out their shares or have seen a slight decrease in shareholders given the dramatic increase in the number of CSA farms. Consequently, although the summer growing season is underway and the distribution of shares has started, a search for a CSA farm to join would likely still be successful.